Again carrying on from last week, I’m working through the 18 biggest unsolved mysteries in physics by Natalie Wolchover and Jesse Emspak. I’ve done the first nine. The next topic concerns grand unified theories, the sort of thing Alan Guth was thinking of when he came up with inflation. A grand unified theory or GUT is said to be a step toward a theory of everything or TOE. The universe experiences four fundamental forces: electromagnetism, the strong nuclear force, the weak interaction (also known as the weak nuclear force) and gravity. To date, physicists know that if you turn up the energy enough – for example, inside a particle accelerator – three of those forces “unify” and become a single force. Physicists have run particle accelerators and unified the electromagnetic force and weak interactions, and at higher energies, the same thing should happen with the strong nuclear force and, eventually, gravity. But even though theories say that should happen, nature doesn’t always oblige. So far, no particle accelerator has reached energies high enough to unify the strong force with electromagnetism and the weak interaction. Including gravity would mean yet more energy. It isn’t clear whether scientists could even build one that powerful; the Large Hadron Collider (LHC), near Geneva, can send particles crashing into each other with energies in the trillions of electron volts (about 14 tera-electron volts, or TeV). To reach grand unification energies, particles would need at least a trillion times as much, so physicists are left to hunt for indirect evidence of such theories. Besides the issue of energies, Grand Unified Theories (GUTs) still have some problems because they predict other observations that so far haven’t panned out. There are several GUTs that say protons, over immense spans of time (on the order of 10^36 years), should turn into other particles. This has never been observed, so either protons last much longer than anyone thought or they really are stable forever. Another prediction of some types of GUT is the existence of magnetic monopoles — isolated “north” and “south” poles of a magnet — and nobody has seen one of those, either. It’s possible we just don’t have a powerful enough particle accelerator. Or, physicists could be wrong about how the universe works. Unfortunately most physicists don’t know about the screw nature of electromagnetism. Or what charge is. Or that electromagnetic field interactions result in linear electric force and/or rotational magnetic force. It’s one field and two forces. Electrons and positrons move towards one another and around one another because they’re dynamical “spinors” in something akin to frame-dragged space. Think in terms of counter-rotating vortices. Their motion does not occur because they’re throwing photons back and forth. See the peculiar notion of exchange forces part I and part II by Cathryn Carson. The exchange-particle idea worked its way into QED from the mid-1930s, even though Heisenberg used a neutron model that was later retracted. I’m afraid to say the idea that particles move because they’re throwing photons back and forth is lies to children. In addition most physicists can’t explain the weak interaction. 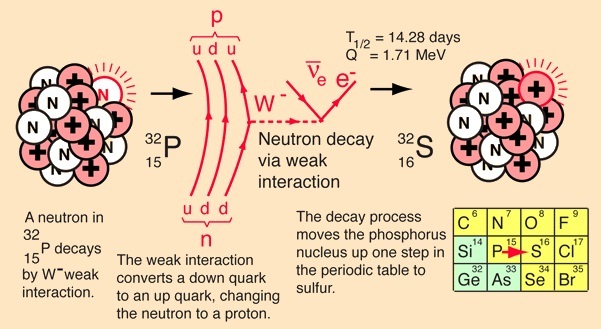 They’ll tell you that a neutron with a mass-energy of 939 MeV decays because a W boson with a mass-energy of 80 GeV pops out of a down quark with a mass-energy of 4.8 MeV, converting it into an up quark with a mass-energy of 2.3 MeV. Then this W boson decays into an electron and an antineutrino with a combined mass-energy of circa 1 MeV. So quickly that you can’t actually see the W boson. Just like you’ve never seen a quark. Or the angels on the head of a pin. What they won’t tell you is that electron capture does what it says on the tin. Or that free neutron decay is the jumping popper of particle physics. They don’t understand the nuclear force either. That’s the force that keeps neutrons and protons together in a nucleus. They’ll tell you about pion exchange, even though protons and neutrons aren’t throwing pions back and forth. But they won’t tell you that the nuclear force has been one big disaster. Or about Chadwick’s Bakerian lecture where he said “the electric field between a neutron and a nucleus is small except at distances of the order of 10-12 cm”. Nor will they tell you that “the neutron has a negatively charged exterior, a positively charged middle, and a negative core”. As for the strong force within a proton, they’ll tell you that quarks are throwing gluons back and forth. What they won’t tell you is that the gluons in ordinary hadrons are virtual. That’s virtual as in not real. Ever seen a gluon? No. Nobody has, so I rest my case. Particularly since there’s an extra force of sorts in electromagnetism. A strong force that converts a 511keV photon into an electron or a positron, then keeps it that way. A strong force that’s undone in electron-positron annihilation. It’s clear to me that the same applies to proton-antiproton annihilation. And that the elastic quality of the bag model is related to the elastic quality of space that keeps a gamma photon propagating through space at c.
Most physicists don’t understand gravity either. Some will tell you particles are throwing gravitons back and forth. Some will tell you a photon curves because it follows the curvature of spacetime. Some will even tell you that gravity “springs from the quantum entanglement of small bits of spacetime information”. None of this is true. Gravity is there because a concentration of energy in the guise of a massive star alters the surrounding space, this effect diminishing with distance. As a result there’s a gradient in the speed of light, so light curves downwards like any wave curves when there’s a gradient in wave speed. Then matter falls down because of the wave nature of matter. Think in terms of light going round a square path, wherein the horizontals curve downwards. It’s the same for antimatter, which has the opposite chirality. All in all, most physicists don’t understand any of the forces. So they’re winging it when they say “if you turn up the energy enough three of those forces unify and become a single force”. They’re also winging it when they tell you that protons decay, even though they don’t know what a proton is. And when they tell you that magnetic monopoles exist, even though they don’t know how a magnet works. Even though they do know that a current loop has both an upper side and a lower side. Do the universe’s forces merge into one? No. Are physicists wrong about how the universe works? Yes. Quantum information is a bit different from the information we store as 1s and 0s on a computer, or the stuff in our brains. That’s because quantum theories don’t provide exact information about, for instance, where an object will be, like calculating the trajectory of a baseball in mechanics. Instead, such theories reveal the most likely location or the most likely result of some action. As a consequence, all of the probabilities of various events should add up to 1, or 100 percent. (For instance, when you roll a six-sided die, the chances of a given face coming up is one-sixth, so the probabilities of all the faces add up to 1, and you can’t be more than 100 percent certain something will happen.) Quantum theory is, therefore, called unitary. If you know how a system ends, you can calculate how it began. McNees said there has been a lot of work on the subject, notably by Stephen Hawking and Stephen Perry, who suggested in 2015 that, rather than being stored within the deep clutches of a black hole, the information remains on its boundary, called the event horizon. Many others have attempted to solve the paradox. Thus far physicists can’t agree on the explanation, and they’re likely to disagree for some time. There’s just so much wrong with this one. It’s like for want of a nail. The nail here being “the curvature of light rays occurs only in spaces where the speed of light is spatially variable”. That’s what Einstein said. It means that in a gravitational field, the ascending light beam speeds up. In a very strong gravitational field, it speeds up all the more. However it doesn’t escape a black hole because that’s a place where the speed of light is zero. When you drop your cube of iron into a black hole it falls faster and faster because the speed of light is getting slower and slower. This clearly can’t continue ad infinitum, because if it did, your cube of iron would end up falling faster than the local speed of light. That can’t happen because of the wave nature of matter, and because falling bodies don’t slow down. Instead your cube of iron turns into a gamma ray burst, as described by Friedwardt Winterberg in his 2001 paper gamma ray bursters and Lorentzian relativity. BOOM! Gamma ray burst image from What caused the monster gamma-ray burst of April 2013? If we simplify matters by dropping an electron into a black hole, I expect we’d observe gamma photons and/or neutrinos or antineutrinos being emitted in orthogonal directions. Then if we dropped a positron into a black hole, I expect we’d observe gamma photons etc being emitted in different orthogonal directions. As such, you could say “quantum information” was preserved. However anything that headed into the black hole is lost forever. Ditto for anything that was swallowed up by an event horizon expanding outwards during a stellar collapse. A black hole is a place where gravitational time dilation is infinite and the speed of light is zero. Nothing can move faster than light. This means there’s no angular momentum and no charge. That means the information is gone. There is no way to retrieve this information. A black hole formed from a collapsing mass of hydrogen would be indistinguishable from a black hole formed from a collapsing mass of antihydrogen. You have no way of knowing how this system began. Quantum mechanics might claim that quantum information can’t be destroyed, but quantum mechanics doesn’t cover gravity. So that’s that. As for “nothing comes out of a black hole except a slow trickle of thermal radiation called Hawking radiation”, there’s no evidence for Hawking radiation. That should be no surprise, because when you dig into the Hawking papers you don’t there’s no foundations either. Instead you find virtual particle pairs being spontaneously created like worms from mud, and negative-energy particles. The latter are, most conveniently, the particles that fall into the black hole. If that doesn’t do it for you, Hawking offered particles travelling back in time and bouncing off the gravitational field. It’s garbage. But note that the information paradox isn’t just there because of Hawking radiation. It’s also there because of the Copenhagen interpretation. That’s garbage too, and in this case two wrongs don’t make a right. Instead they make a not even wrong. That’s why people talk about information remaining on the boundary of the black hole. They invoke the holographic principle and the AdS/CFT duality. The former says “volume itself is illusory and the universe is really a hologram”. It’s yet more garbage. The latter is an unsupported conjecture that there’s some deep relationship between two other unsupported conjectures. That’s even more garbage. As is Leonard Susskind’s absurd claim that information “can simultaneously cross the event horizon and never cross the event horizon”. There is no information paradox. Instead there’s layer upon layer of over-hyped garbage peddled by lost-in-math quacks who don’t even understand how gravity works. That’s why they don’t understand black holes. Don’t just take my word for it. See Yvan Leblanc’s 2015 paper on misleading concepts in quantum gravity: black hole thermodynamics and the holographic principle. What happens inside a black hole? Nothing. A black hole is a place where gravitational time dilation is infinite and the speed of light is zero. Nothing can move faster than light. So nothing moves. So nothing happens. So that’s that. A singularity occurs when some property of a “thing” is infinite, and so the laws of physics as we know them break down. At the center of black holes lies a point that is infinitely teensy and dense (packed with a finite amount of matter) — a point called a singularity. In mathematics, singularities come up all the time — dividing by zero is one instance, and a vertical line on a coordinate plane has an “infinite” slope. In fact, the slope of a vertical line is just undefined. But what would a singularity look like? And how would it interact with the rest of the universe? What does it mean to say that something has no real surface and is infinitely small? But whether singularities can form without an event horizon is still an open question. And if they can exist, then Albert Einstein’s theory of general relativity will need a revision, because it breaks down when systems are too close to a singularity. 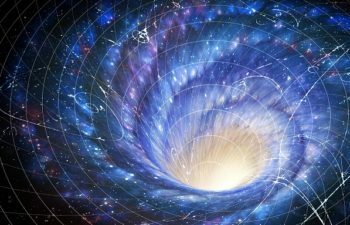 Naked singularities might also function as wormholes, which would also be time machines — though there’s no evidence for this in nature. As for what some “infinitely teensy dense singularity” would look like, who cares? There is no such thing. There are no things that have no real surface and are infinitely small. Naked or not. Nor are there any black holes without an event horizon. Because that’s where the speed of light is zero. That’s why the light can’t get out. That’s why the black hole is black. So no, there are no naked singularities. So no, whether singularities can form without an event horizon is not an open question. So Albert Einstein’s theory of general relativity doesn’t break down. And no, naked singularities don’t function as wormholes. Or time machines. Because they don’t exist. Hadley said the rotation of our galaxy results in frame-dragging, and that this causes a difference in the decay of the matter and antimatter versions of the kaon. I think he could be right. If he isn’t, I’m confident that there will be some other simple reason for the difference. That’s because I know that there is no magic. Instead I know how a magnet works, and that there’s clear evidence that the weak interaction has an electromagnetic nature. For the cherry on top, the same goes for the nuclear force. Image from Evidence for the 2π Decay of the K₂⁰ Meson by Cronin and Fitch. Note the magnets. Please engage with the physics Parth, instead of spamming your website.